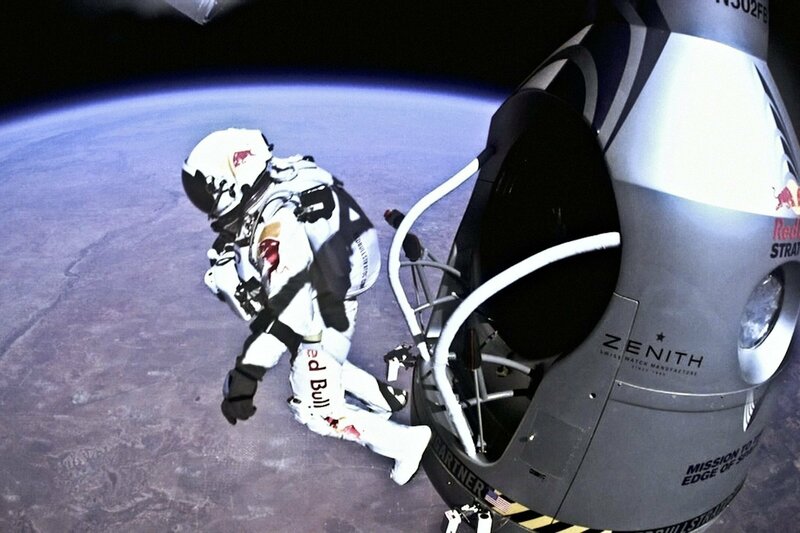 The same excitement millions of people felt all over the world on October 14, 2012 as Felix Baumgartner took a record-breaking 127, 852 foot leap from the edge of space, was felt last night at the Red Bull Stratos Exhibit Opening. The Red Bull Stratos exhibit will be at the California Science Center from October 13, 2013 to January 12, 2014 before permanently moving to the Smithsonian Institution, offering Californians an opportunity to be face to face with, and learn about, the equipment that helped make history. The exhibit showcased the results of a group of people’s ingenuity and hard work. At the exhibit people had an opportunity to look at, and take pictures in front of the 3,200-pound capsule that carried Baumgartner to the stratosphere, his free-fall destination. Attendees were not only excited to take a close look at the capsule, but also at the space suit Baumgartner wore, with which some of the attendees took a picture next to. Many of the attendees not only posed alongside this equipment, they also learned about it. The exhibit included four stations with information about the equipment, and the team, and illustrations and videos outlining the step-by-step ascending and descending of Baumgartner. There is no doubt the highlight of the night was the appearance of Baumgartner’s mentor Col. Joe Kittinger, who in 1960 broke record after jumping to Earth from 102, 800 feet. Kittinger was joined by Project Director Art Thompson, Medical Director Dr. Jonathan Clark, and High Performance Director Dr. Andy Walshe, who aside from discussing the mission, and answering questions, were in great disposition to sign autographs, take pictures, and have one on one conversations with attendees. After the excitement of looking at the equipment and seeing some of the Red Bull Stratos team members, attendees were treated to the screening of the documentary, now available at rdio.com/ redbullstratos, “Mission to the Edge of Space: The Inside Story of Red Bull Stratos,” which highlights the five years leading up to October 14, 2012. Visiting the Red Bull Stratos exhibit at the California Science Center allows people an opportunity to relive Felix Baumgartner’s jump from the edge of space, and take with them, the notion that everything is possible.